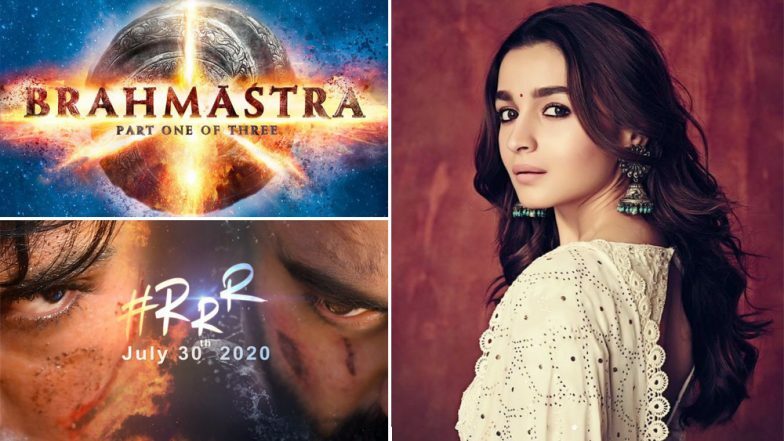 Inshallah, RRR, Brahmastra: Which Alia Bhatt Movie Are You Most Excited About? After the back to back successes of films such as Raazi and Gully Boy, Alia Bhatt is quickly becoming the actress we all want to place our bets on. In the past couple of days, we have seen floor us with her beauty in the teaser of Kalank and also surprise us with her upcoming film announcements. Apart from the big news that the actress will be making her South debut with SS Rajamouli's RRR, the big news of the day has been that she's bagged a Sanjay Leela Bhansali film alongside Salman Khan. Yes! The girl is on a roll and we couldn't be more excited to see her enthrall us with some big performances. Here's looking at a list of her upcoming projects. Sanjay Leela Bhansali is all set to make another grand film with an even eclectic star cast than before with his next, Inshallah. The film will see Bhansali reunite with Salman Khan after over twenty years and we know this film will be special. This also marks Alia Bhatt's first ever association with the Padmaavat director and also Salman Khan as a co-star. Even as this sounds like an odd pairing, we can't wait to find out more details on this film. From Signing Rajamouli's RRR to Working With Salman in Bhansali's Inshallah, It's Good Time to be Alia Bhatt! Post the massive success of Baahubali, fans have been waiting to know what director SS Rajamouli planned for his next. After the big announcement of RRR last week, one of the key highlight of the film has been Alia Bhatt's foray into the South industry. Starring South superstars in the lead, Ram Charan and Jr NTR as the male leads, the film is a fictional tale revolving around real-life characters. We have seen Rajamouli handle women characters extremely well in his films, what with Ramya Krishnan's brilliant character of Sivagami or Anushka Shetty's warrior princess Devsena. It will be interesting to see what Alia Bhatt will do in RRR! Karan Johar's next, titled Takht is expected to be one big period drama with an ensemble cast of Alia Bhatt, Janhvi Kapoor, Vicky Kaushal, Ranveer Singh, Bhumi Pednekar, Anil Kapoor and Kareena Kapoor Khan. There have been reports that Ranveer will be essaying the role of Dara Shikoh, the eldest son of Shahjahan, while Vicky will be stepping into the shoes of his younger brother Aurangzeb. Alia Bhat is supposedly playing the role of Ranveer's wife Begum Nadira Banu. The film is slated for a 2020 release. There are several reasons why Ayan Mukerji's next, Brahmastra is one of the most anticipated films of the year and one of them is undeniably the chance to see real-life couple Alia Bhatt and Ranbir Kapoor on-screen for the first time. The film also stars Amitabh Bachchan in the lead and is expected to be one of Mukerji's most ambitious projects which is a trilogy. Post the logo launch of the film, it has certainly induced interest among viewers. It is set to release in Christmas 2019. Brahmastra Magic At Kumbh 2019: Skies Light Up With The Logo Of Ranbir Kapoor and Alia Bhatt Starrer (Watch Video. The 40s period drama looks like one big royal affair and Alia has probably never looked better. If the teaser was any less, her classical dance moves in the freshly released song 'Ghar More Pardesiya' are sure to leave you swooning. While we don't know much about her character Roop in the film, the larger than life feels that the film is giving have surely piqued our interests. Kalank Song Ghar More Pardesiya: Alia Bhatt-Madhuri Dixit’s Classical Face-Off and Varun Dhawan’s Kohl-Eyed Intense Gaze Make This Track Magical – Watch Video. One of the most special films for Alia's career is certainly going to be Sadak 2. The film marks the comeback of her father, veteran director Mahesh Bhatt after nearly two decades and this will be the first time he will direct his daughter, Alia Bhatt. The sequel to 90s blockbuster will also bring back the original pair of Pooja Bhatt and Sanjay DutAdityator Adity Roy Kapur has also been signed on for an important role. The film is expected to release in March 2020. It certainly seems difficult to say which of these projects seems the most exciting one. We are more than excited to see Alia experiment and time and again prove her versatility. For now, we would love to watch Kalank and feast our eyes on this gorgeous lady. Which upcoming film of Alia Bhatt are you most excited for? Let us know your answers in the comment section below. Which Upcoming Release of Alia Bhatt Are You Most Excited About?